I may be more interested in making chocolate things, now that I have an outlet for them. I’ll try a bite here and there, but I still don’t search out chocolate things (save my absolute favorite candy that is hidden inside this cupcake) but most of the things I bake get packed up and delivered to people who really like chocolate – most of them end up not making it to their drop off point once they enter my dad’s truck in the morning, but it’s the thought that counts. Now I know not to ask the guys at the supply house if they’ve tried xy, or z just incase my dad had a long day, or was super hungry or didn’t feel like sharing. When nobody came to our door on Halloween, and we were unable to tackle the stock pot full of candy in our day-to-day, I decided I needed to try to use up as much of it as I could possibly use to cook with. The downside being, we don’t really eat sweets all that regularly. When I do make something sweet, off it goes the next day to be tasted by about half a dozen people, if not more. Plus, not every candy seems that easily to transition into a baked good. Once I catch up on some more Cupcake Wars, I’m sure I’ll be proved wrong, but I haven’t found quite enough time for that yet. 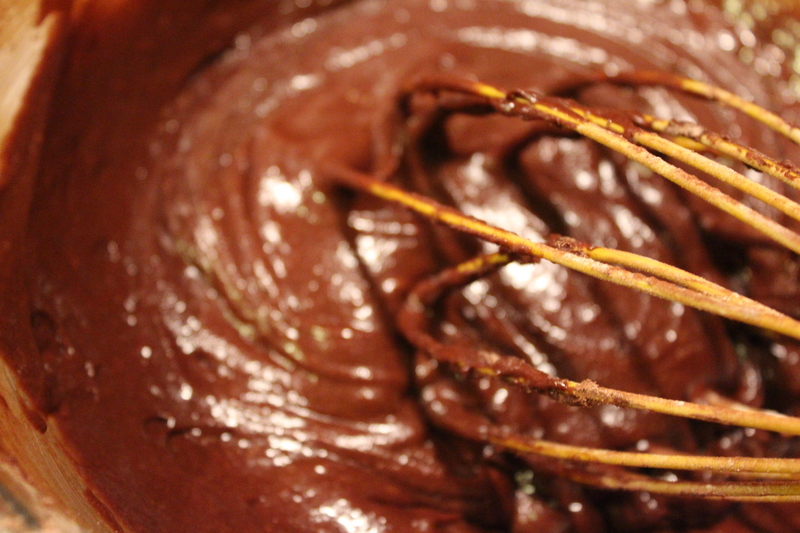 First, a good fudgey brownie recipe is in order. One of the things that I learned, after my first brownie try, is that brownies weren’t supposed to be beat too much. I uttered this out loud and my boyfriend -who usually just suggests I make peanut butter cookies, when I’m behind the counter- said you didn’t know that? Ugh. I hate being the last to be let into the loop on things! From now on, I will be mixing my brownies by hand. take 10 reese’s, put them in the fridge to chill. cut four-five of them into quarters. Step 1: melt butter in a medium-large prep bowl. mix in sugar and heat for about 1-2 minutes. either in a microwave or a double boiler. 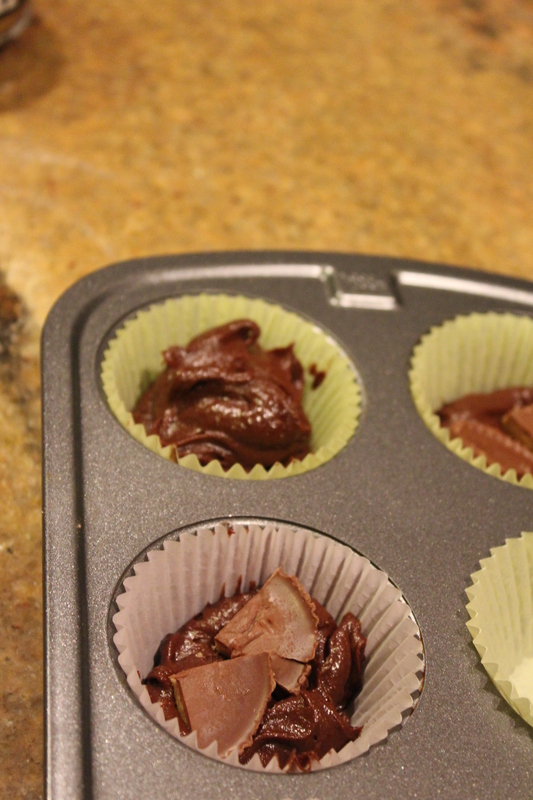 I used a double boiler the first time I made them, and then the second time, because I was short on time (aka started making them at 10pm…) mix until smooth again. 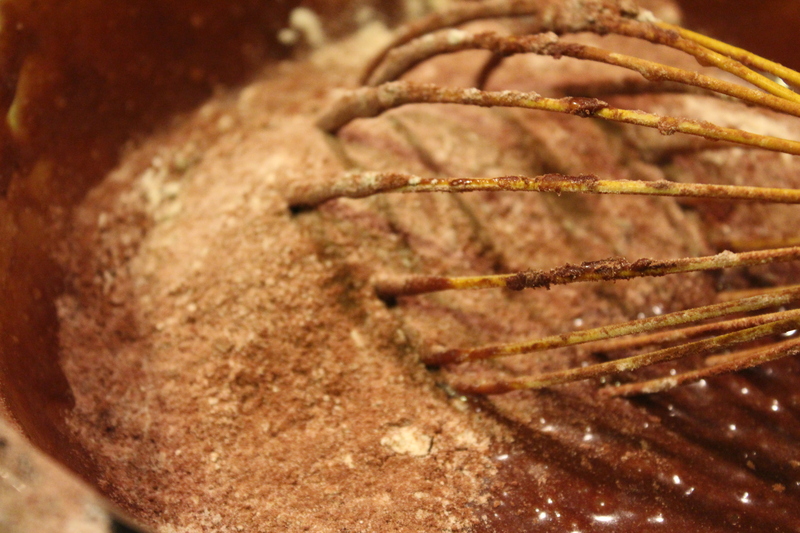 Whisk in vanilla and eggs – until combined and smooth. 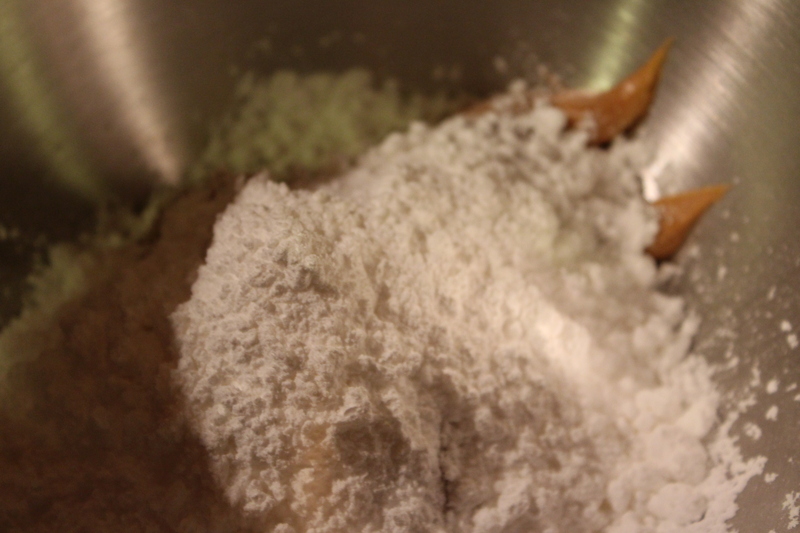 Step 2: in a separate bowl, sift together: salt, baking powder, cocoa powder, and flour, slowly add dry ingredients to wet, stirring until just combined. Fill tin with liners, and then fill each liner with 1 tablespoon of batter, add two quarters of the reeses that you already chopped up. Top each with another 1 tablespoon of batter to cover. 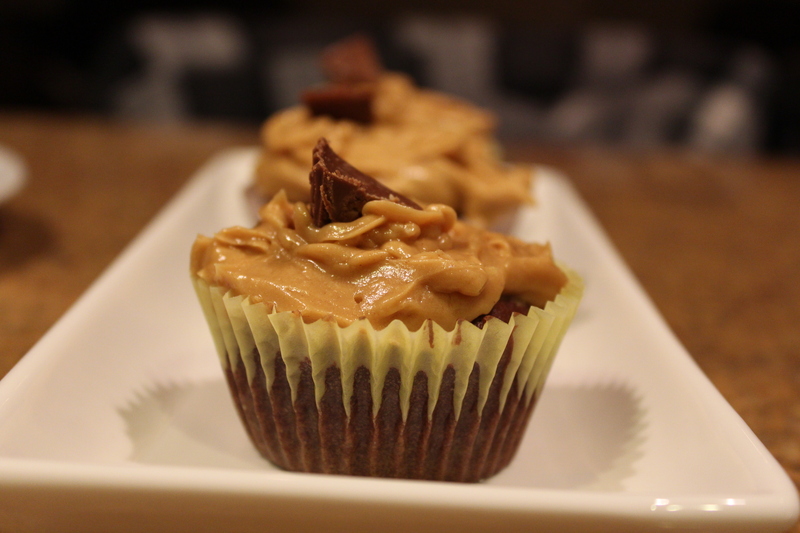 Bake for 8-12 minutes – test with a toothpick to see if they are cooked through, though they might seem like they aren’t all the way cooked, because they are very moist cupcakes. Cool completely before icing. I used this icing that I can’t remember where I found it, and the usual trick for backtracking my history isn’t working as well as it usually does. So I’ll hopefully find to who to credit it to, and edit it in soon. 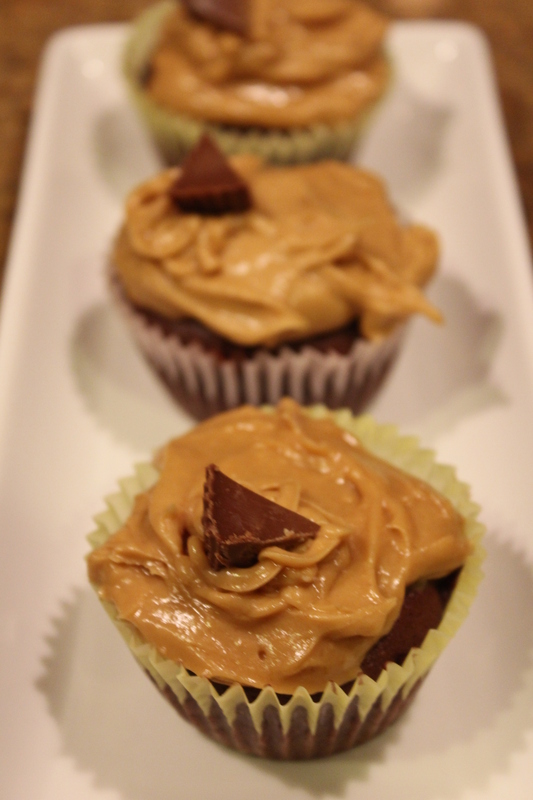 You could alternatively use a really good buttercream frosting, because I’ll be honest, even as much as I like reeses, I am thinking I’ll try with a less intense combination next time. Mix this up in a stand mixer, and set up in the fridge for another day if you have some left over. 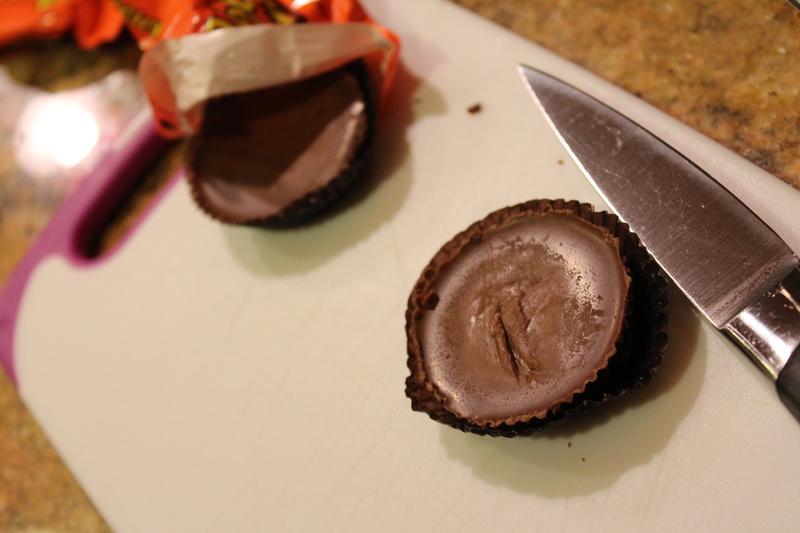 Cut the remaining reeses into 1/8ths, and put one ontop of the cupcake, or if you don’t want to, just eat the rest of the reeses you have in your fridge. I’ve tried freezing it (the left over icing) this last time to see if it ends up working well next time I use it. It’s only been in the freezer for a week or so at this point, if anybody has any tips on how to use/freeze icing well I’d appreciate. But these are more creative and I like your photos better. Great job.